Bushy Beardgrass For Sale Online. Low Wholesale Prices. The Andropogon Glomeratus, colloquially called “Bushy Beardgrass,” is a wildland grass native to the Americas. Bushy Beardgrass is blue-green in the summer and turns coppery-colored in the winter. The feathery bloom adds to the sedge’s appealing appearance. The bloom time is in September. Bushy Beardgrass is also known as Andropogon glomeratus. Hardy planting zones are 5-9. The growth rate is 1½ -foot per year. This grass thrives in wet conditions such as bogs, marshes, and swamplands. It requires full to partial sun and does well in shallow standing waters. The blooms have a silvery hue. The wispy grass can reach 2-5 feet in height and 1-2 feet in width. The grass is commonly used as foliage in water gardens. It is also a popular dried floral arraignment addition. This beautiful grass looks impressive when backlit by early morning or late afternoon sunlight. It’s hardy and is typically free of severe insect infestations or disease making it low maintenance. The clump-forming ornamental grass is desirable for its small, club-shaped flower/seed panicles, in shades of silvery-pink to cream, and its attractive foliage. Even after a frost, it retains its beauty. After exposure to the cold, the foliage and fluffy flower clusters turn a coppery-orange color with the groups smoothing into billowing plumes. The warmer fall colors last well into the winter season and continue to provide attractive textures in supporting landscapes. Many artisans find the plumes make lovely additions in dried flower arrangements and other arts and crafts creations. 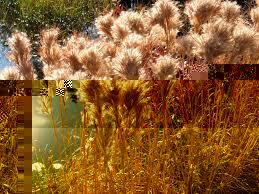 Those seeking to create, or invigorate, a rain garden, will find bushy beardgrass makes an ideal addition to their project. Rain gardens are an excellent way to improve water quality in nearby bodies of water, helping keep waterways pollution-free. Bushy beardgrass not only adds unique texture and color to such a beneficial collection of plants, but it also flourishes in the environment the rain garden provides that so closely matches the marshes, pastures, swamp peripheries, and coastal areas it’s native to. Bushy beardgrass also dramatically benefits wildlife. Its seeds provide food for bird species like a finch, junco, and tree sparrows. Rabbits and white-tailed deer even browse the grass. It can efficiently provide protective cover for fawns and other small animals in its environment. Versatile, beautiful, and nurturing, bushy beardgrass has many benefits to offer the discerning gardener. Looks amazing around my pond!